Our Story - Lafeber International Ltd.
Lafeber Company was built by a father-son team of veterinarians with a shared love of animals and a special passion for birds. Dr. Lafeber, Sr. developed the very first commercial bird food pellet in the back room of his veterinary clinic in the early 1970′s. Today our recipes are developed by his son, Dr. Ted Lafeber, III along with top veterinarians and nutritionists. Every diet is tested by an independent laboratory to insure optimum pet health. Lafeber Company also consults leading experts in behavior so that our diets provide dietary enrichment and fun. Lafeber Company’s manufacturing facility has always been located on the Lafeber family farmland, and all of our products are mixed, formed and packaged under one roof with equipment specifically designed for small batches. Carefully watching food production process from start to finish gives us the opportunity to maintain our high standards. The story of pet bird food & nutrition is, in many ways, the story of Dr. T.J. Lafeber (right), who graduated from Iowa State University College of Veterinary Medicine in 1949. During the late 1960′s and early 70′s, Dr. Lafeber’s pet bird hospital was the largest in the United States. He was even asked by the American Veterinary Medicine Association to chair a newly formed committee on avian medicine in the 1960’s. As Dr. Lafeber treated hundreds of pet birds over many years, he recognized that malnutrition was a common problem. When Dr. Lafeber investigated the bird foods available on the market at that time, he soon discovered that most of the foods were various types of seed mixes, all of them deficient in certain vitamins, minerals, and protein. In the early 1970′s, Dr. Lafeber began experimenting with a pelleted food for birds. Initially, he made the pellets in a small mill in the rear of his animal hospital and dispensed the food to bird owners. In the late 1970′s, Dr. Lafeber purchased 5 acres of farmland from his father and it was on this site that Lafeber Company was born. Dr. Lafeber’s desire to provide pet birds with a high-quality, nutritious diet became the driving force behind Lafeber Company. Throughout the history of Lafeber Company, quality has been the key to our success. Attention to the ingredients used in the pet bird food product line along with a strong focus on the needs of our customers have helped Lafeber Company establish a reputation as one of the premier companies in the pet food industry. Our mission to this day revolves around the simple premise Dr. Lafeber established many years ago: working for the health of animals. 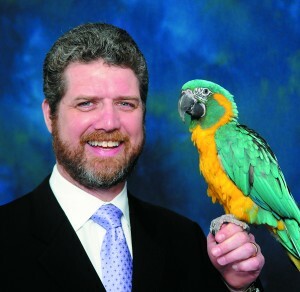 Today Dr. Ted Lafeber III (right), is the president and CEO of Lafeber Company. Dr. Lafeber’s dedication to avian health and nutrition began at a very early age. At age 9, he accompanied his father, Dr. T.J. Lafeber to his animal hospital to clean cages every Sunday. A few years later, at age 13, he learned how to run the bird pellet machine in the back of Niles Animal Hospital, where his father created the first formulated bird food. Dr. Lafeber went on to earn his Doctorate of Veterinary Medicine from Iowa State University, the same school where his father received his veterinary degree 39 years earlier. After Dr. Lafeber received his doctorate in 1998, he and his father became business partners. In 1989, the father-son veterinary team developed Nutri-Berries, which were designed to provide the nutritional balance of pellets, the taste appeal of seeds and the foraging enrichment experience that is found in the wild. Nutri-Berries continue to be a great success many years later. Since the passing of Dr. Lafeber Sr. in 2001, Dr. Lafeber has maintained the tradition of high quality products combined with product innovation. In 2004, Dr. Lafeber received the prestigious Outstanding Service Award from the Association of Avian Veterinarians in recognition of his commitment to the well being of birds. In 2007, Dr. Lafeber received the prestigious President’s Award from the Association of Avian Veterinarians in recognition of continued dedication to the health and welfare of the avian population.